When I returned home Linkin sayt I’d been away so long the mistress feared some mischance had befell me. He seemed troubled too. Though not (as I later learnt) on my account. He took that for his kew [cue]. He high-tailed it to her, and spake aloud in the verie torrent and tempest of passion. Nowt against me, mark you. His wauls were of his fearful journey, his empty belly, his beating by an honest cat who mistook him for a rogue. And what a spectacle he were. One eye half-closed, one ear bloodie, his back begrimed, his belly kicked bald. He rose on his legs and held hisself against her gown with one paw while he sawed the air with the other. Next I knew, he were in our house supping broth with a fish in it. While the mistress sayt what a loving cat he were. And not afeared of Wattie our dog. Doubtless he sought a place in our household. Well, he were welcome to mine. But not before the Earl of Essex was in favour again, and our Earl could offer me a better place than the one I had. The next time I went to Essex House I did not stay long, lest I be shut in when all set forth to White-Hall. As ever, there was talk of plots against Essex’s life. Many feared an attack and were making weapons readie. Essex did not leave the house that day. He played at tennis. After dark there came servants from the Privy Council, summoning him. Twice. He, rightly wary, would not go. He sayt he was too sweatie after tennis. He sayt he was a-bed. I saw our Earl whispering with the pretty Penny and Sir Charles Daffers [Danvers]. They feared Sir Rabbit knew of our plat to enter White-Hall. Our Earl and Sir Charles sayt it was not too late for Essex to flee England. I did not think he would. They went in to supper with the other special friends. No word of invitation to me, so I came away. On the river wall I met Onix and Kettie the Turkey Cat. 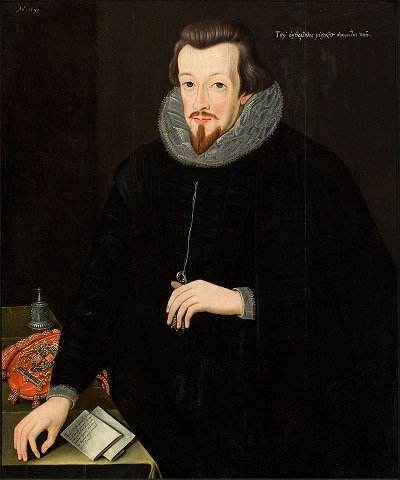 I swore them to secrecy and told of the plat for White-Hall: the Queen saved from evil counsel, her place promised to Scotland’s King, the Earl of Essex restored to his offices, Sir Rabbit on trial. “Trial for what?” arrkst Onix. That made them prick their ears. Then I arrkst if they’d seen or heard owt pertaining to Essex. They told of some of his friends coming from the river and going up the lane to a tavern. They’d seen nowt else since. We sat awhile, musing on the wickedness of players. Then I bethought me of the mischiefs the Player Cat might be working in my absence, and went home. Later Kettie and Onix came to our yard to report strange doings at Essex House. “His lordship’s friends come and go in great haste,” sayt Onix. Creeping close, they’d heared one say that if Essex could not be lured from his house, then he’d be murdered in his bed. Kettie sayt he was a good citizen, but durst not meddle in affairs of state lest he be thought a foreyn [foreign] troubler. He’d keep watch from his print shop near Paws [St Pauls], but could do no more. Onix, feigning boldness, vowed to slip out on the morrow and go to Essex House. The morrow was a day for sermons. Our household went to Paws. I sat on the wall of our yard awaiting Onix. Linkin joined me, but onlie to complain. He sayt the master meant to take another wife. Our mistress would return to the countrie. He did not wish to go. He were too old to travel. Etcetera. 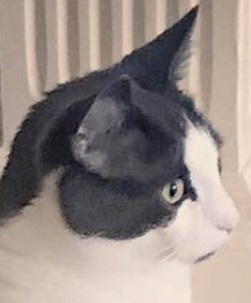 I feigned to listen, but sat swivel-eared. The citie oft hummed, but that morn it were rumbling with sounds above the ordinary. Trampings of feet, the rattle of chains. Where was Onix? If he’d gone alone to Essex House before ’twas light enough for men to see him, why had he not returned? Kettie was flying across the rooves towards us. There came many men’s voices. 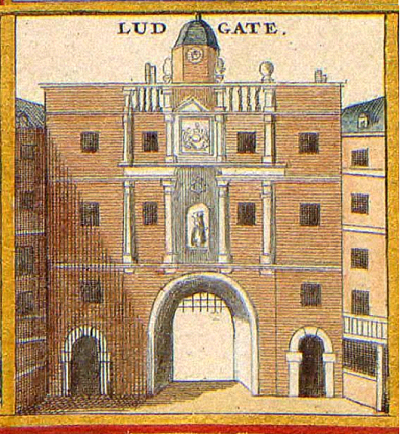 The Ludgate, from a drawing c1650. It probably looked much the same on Sunday 8 February 1601 when the Earls of Essex, Southampton, Rutland, and Bedford walked along the Strand and Fleet Street with their followers and entered the city.